Sinus issues can be painful, and when all four sinus cavities are inflamed, it can be enough to stop you in your tracks. Pansinusitis presents a combination of symptoms that can affect your cheeks, eyes, forehead, and nose all at once. This is a serious medical condition that warrants immediate treatment. If you think you are suffering from a sinus problem, check your symptoms against our list and see if our pansinusitis treatment home remedies are right for you. There are four pairs of cavities connected to our nose, which are known as paranasal sinuses. Our maxillary sinus is located on the cheekbone, while our frontal sinus sits directly above the eyes in the forehead. Our ethmoid sinus is close to the eye and nasal bone, and our sphenoid sinus is towards the back of the nose, just below the base of the brain. Often, one of these paranasal sinuses will become irritated or inflamed by an infection or allergens. When this invader affects all four paranasal cavities on either or both sides of face, it is called pansinusitis. It should be noted that pansinusitis is seen mostly in adults as our sinuses are not fully developed until the age of 12. Nevertheless, there have been cases seen in younger children and infants due to a developmental condition. When all four sinuses are affected, a bacterial or viral infection is usually the instigator. These infections appear when our immune system is working at a lower capacity and allows tiny foreign substances to enter our body through the nose. A serious case of an upper respiratory infection can lead to pansinusitis. It can be acute or chronic, with the latter sometimes lasting years. A low-functioning immune system may also allow the fungi that drift into our nose to cause inflammation in the sinuses. When our system is in tip-top shape, any fungi that enter our body can be dealt with and held at bay without causing any issues. Existing health conditions may also play a role in the sinuses becoming inflamed as with nasal polyps, asthma, rhinitis, and a history of sinus problems. Our sinuses can also be affected by allergens such as smoke, dust, mold, pet dander, and other environmental pollutants. Pansinusitis can also be caused by dental problems such as an infected tooth abscess and swimming in dirty water. It may sound strange until you remember how all of the nasal cavities are connected. For those with a deviated nasal septum, normal breathing can be difficult, and the addition of inflammation can affect all sinus cavities. Trauma or injury to the face can also result in pansinusitis. Sinus aches and other symptoms are easy to recognize for those who have suffered from the condition. Pansinusitis presents these and other symptoms at a higher degree of severity. Some of the symptoms can last for several weeks, months, or even years. Once medical tests confirm that pansinusitis is the source of the problem, treatment is focused on the cause. Antibiotics are the most common medication recommended. In extreme cases of pansinusitis, surgery may be necessary. Usually, this only occurs if the condition is associated with polyps or a nasal deformity such as a deviated nasal septum. As we strive to use natural home remedies to combat symptoms, let’s take a look at examples of pansinusitis treatments that may help alleviate some of the sinus problems. Use steam to reduce any inflammation causing the nasal congestion and mucus blockage. Place a towel over your head and shoulders as you lean over a large bowl of hot water. Breathe in the steam. You can also create a steam room in your bathroom for this effect. By drinking water throughout the day, you can thin out the mucus that may be blocking the cavities. Enjoy the soothing taste of herbal teas and allow the steam from the cup to enter your nose. Apply a heated towel or warm compress to your entire face, covering the nose, eyes, cheeks, and mouth. Rest for five minutes, several times a day. Squeeze the juice from a piece of raw ginger and take two tablespoons twice a day. Use the powerful scent of garlic to clear sinuses by chewing on a small clove. You can also soak peeled cloves in water for 20 minutes before mixing into a paste. Breathe in the aroma of the paste. The age-old illness remedy may help with sinus congestion and inflammation of sinus cavities. Maintain a healthy diet of food containing abundant amounts of vitamins and minerals to fight infection and prevent new infections. Pansinusitis can interrupt your day and have you wanting to crawl under the blankets. 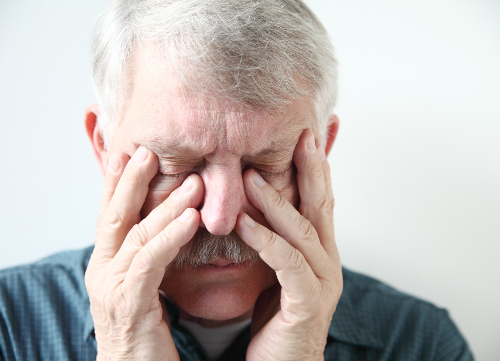 With pain and congestion affecting all four sinus cavities at once, it can really make a person weak with exhaustion. Bacterial and viral infections are usually to blame, but sometimes environmental sources can attack the sinuses. Most cases of pansinusitis can be treated without surgery, and there are several home remedies that may help alleviate symptoms. “What Is Pansinusitis: Causes, Symptoms, Treatment, Home Remedies, Diagnosis,” ePain Assist; https://www.epainassist.com/face-mouth-throat/what-is-pansinusitis, last accessed April 4, 2017. RS, “Get Rid of Pansinusitis | Pansinusitis Symptoms,” Tandurust, September 17, 2009; http://www.tandurust.com/general-health/get-rid-of-pansinusitis.html, last accessed April 4, 2017.